Yes, once again a pastry shot. Today in our neighborhood, Parioli, at Il Cigno, a lovely bakery where we paid too much to sit in the shaded glory of their sidewalk cafe. This was our reward for a 60 minute trip (walking!) to-and-from the “Zero Km” market. 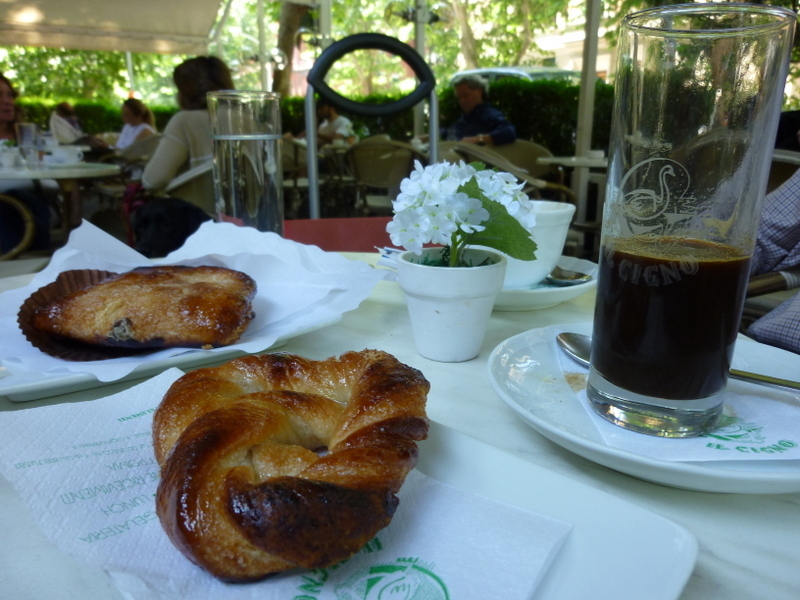 My lovely, flaky pastry, plus Ric’s, today with a caffe freddo at Il Cigno. Caffe freddo is an intense espresso, sweetened, served cold but “short” in North American terms. One can linger but it won’t be over a 20 ounce cup of coffee. Many Romans whiled away the morning here with Sunday papers or friends. Beautifully dressed children darted in-and-out, dogs paraded by. Might have to do this every weekend. 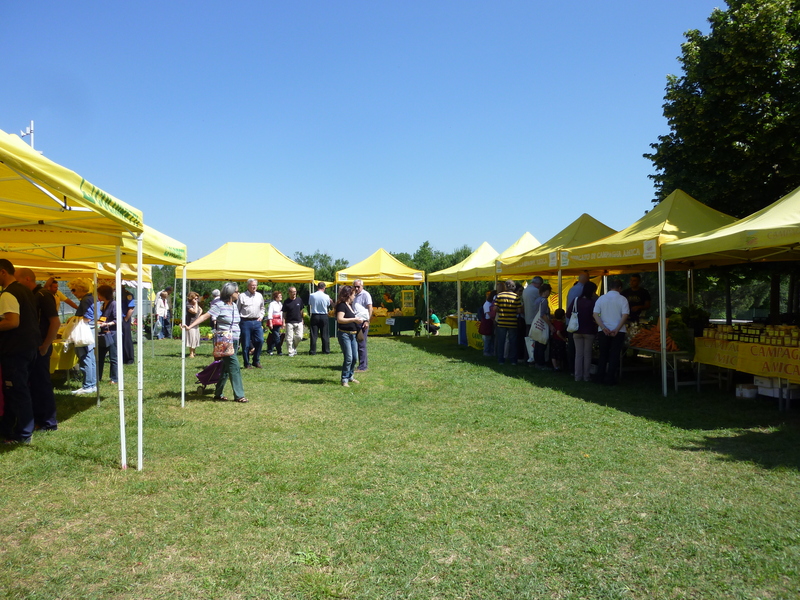 We love our little farmer’s market at Parco della Musica! Regrettably, it will be in hiatus until September. Today we bought olive oil, salumi, pecorino staginato, honey, eggplant, green beans, lentils and chick peas, all from Lazio-based local providers. Soon a posting about shopping with our little wheeled cart. Well! I don’t think all of these yummy pastries are rewards! I’m thinking they are necessary because of all the walking you are doing. Don’t want you two to fade away!! I’m drooling over the coffee selections you have. I’ve been “lurking” here for awhile, but enjoying each of your Blog entries. It sounds like you’ve settled in very quickly and adapted nicely to life in Italy. What an amazing “once in a lifetime” opportunity! Hi Ken! We were just commenting over dinner that it almost feels like we’ve been here longer than two weeks! We still get lost — literally and figuratively — but that’s part of the acclimation. Are you coming to Rome this year? Thank you! You are back from your own Hawaiian adventure. Would you do it again?